Last week the unofficial tally was over 60 runners joined in for the run. That’s the largest crowd we’ve had on a Sunday Morning in the 11 years of training runs. Good group, great run, good times. This week the expected crowd is slightly lower with the Great Stew Chase (the first of the MRC Racing Series runs) and the Derry 16 Miler going on at the same time. 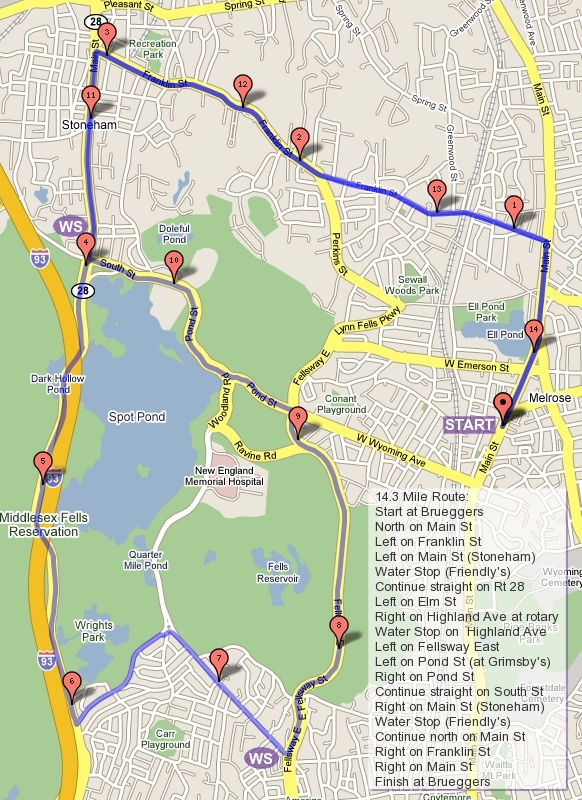 The route this week will follow the foot steps of the old Melrose Law Enforcement Half Marathon. Back before Marathon Sports moved to Melrose, our local running store was called Runners Edge. They hosted the predecessor to what is now Boston’s Run to Remember. We’ll run over to the starting line and run the whole hilly course. The Route: Start on Main Street heading up by Ell Pond. Turn left on Melrose Street, and left on LynnFells Parkway. The starting line was in front of Melrose High School so as you pass there the race is on! (not really, this is just a training run, don’t hurt yourself) If you’re running long you’ll turn left on Tremont Street and circle Ell Pond with a bunch of lefts on Lake Ave, West Emerson, Main Street, Melrose Street, and back on the LynnFells Parkway. This time continue straight on LynnFells Parkway to Grimsby’s. If you’re running the half route, skip the loop and keep going to Grimsby’s. There will be a water stop there if you need it. After Grimsby’s continue along the LynnFells onto the Fellsway East, up to the traffic circle at Highland Ave, turn right on Highland and continue up to the next water stop if you need it. Next, if you’re running shorter, run the front side of Spot Pond by staying right at the Flynn Rink rotary onto Woodland. This will bring you to a right on Pond Street back past Grimsby’s onto West Wyoming. Turn left on Main Street and finish at Brueggers. Next, if you’re running long, circle Spot Pond clockwise with a left on Elm Street, right at the end of Elm onto the Fellsway West, under then over I93, turning right into the Straw Point parking lot, right onto Pond Street past the Stone Zoo, continuing along the pond back to Flynn Rink, through the rotary and back to the Highland Ave water stop. After the Highland Ave water stop, turn left on East Border Road, left at the lights back onto the Fellsway East, through the lights at Grimsby’s onto the LynnFells Parkway, back to Melrose High School. If you were running the old Melrose Half you’d finish the race in front of the bleachers with a loop around the Melrose High School track (which no longer exists). But you’re not running the real Melrose Half so keep going on the LynnFells Parkway, turning right onto Melrose Street and right on to Main Street. Finish up at Brueggers after a good hilly run. Water Stops: I’ll be out there, with help from Hank I presume. If anyone else wants to pitch in, let me know. Last week over 40 of us took the hilliest path over to Spot Pond, around, and back. This week take a step back in distance to recover from that distance with a flat run to Wakefield. The Route: Leaving Brueggers you’ll head North on Main Street, making our way into Wakefield where you’ll stop for water at Nick’s Pizza at the corner of Main Street and Nahant. If you’re running the half distance you’ll turn around and come back just the way you came. If you’re running long you’ll continue along Main Street, through Wakefield Center and staying to the right along the eastern coast of Lake Quannapowitt. Continue counterclockwise around the lake, turning left onto Lowell Street, left onto Quannapowitt Way and along the path past Comverse, left on North Ave, left on Church Street to complete the loop of the lake. You’ll then take a right on Common Street at Wakefield Common. This will merge on to Main Street and back to Nick’s Pizza for another stop. From there you’ll run back along Main Street and back to Brueggers. The Water Stop: I’ll be there. The Roll Call: Who’s in?! Last week we ran on Saturday to avoid running the morning after the MRC Winter Party. The bad news was there wasn’t a Winter Party due to snow, but the good news is we ran on a dry, safe, snow free course instead of in 6 inches of snow on Sunday. Saturday was cold but we avoided snow, and big thanks go out to Hank Murphy for standing in the cold to keep everyone hydrated at the water stops. We had about 40 runners training together up and through the forest of Breakheart. This week we run on Sunday out through the Fells and around Spot Pond. The run will leave Brueggers at 8AM heading towards West Wyoming. Take a right on West Wyoming and run to the first set of lights at Grimsby’s where you turn left. Continue through the hills of the Fellsway East, through a set of lights and turning right onto Highland Ave at the traffic circle. Continue to the end of Highland Ave finding a water stop on the left. The longer route will run a loop of Breakheart Spot Pond. The left at the rotary will put you on Elm Street where you’ll run to the end of Elm and turn right on to the Fellsway West. Follow this under I93 then over I93 and turn into the Straw Point parking lot (if you make it to Friendly’s you missed your turn). There will likely be a small water stop in the parking lot. Follow through the parking lot turning right to follow the pond, past the Stone Zoo and over to the Flynn Rink. Cross the rotary back over to Highland Ave and get another drink at the first water stop again. After the water stop continue on Highland, turning left onto East Border Road. Follow this to the first set of lights, turning left on to the Fellsway East, going back through the hills. At Grimsby’s continue going straight onto the LynnFells Parkway, past Melrose High School, turning right on Melrose Street and right on Main Street finishing your 12.5 miles at Brueggers. Water stops, I think Hank and I will take care of you once again. We started the season with a nice Monday Long Run earlier this week in which 35 runners showed up for the long route and 10 for the half route. A great crowd to kick things off! This week we’re once again changing the day of the week to accommodate holidays. This week’s holiday, the annual MRC Winter Party, will make the ‘S’ in SLR stand for SATURDAY. Let me repeat that: SATURDAY. So show up SATURDAY at 8am at Brueggers for a long route just over 9 miles and a half route measuring in at about 6 miles. This week Mother Nature will remind us that its the Winter season by mixing a little snow into the run. As long as the snow is reasonable in Melrose/Saugus, we’ll stick to the route, but there may be a slight change if Breakheart gets slippery. The Route : We’ll start up the same as last week, up Main Street, after Ell Pond bear right onto Green Street, then turn on to the LynnFells Parkway at the set of lights. Follow the parkway all the way to the entrance to Breakheart, if you pass Target and end up on Route 1 you went to far, come back. At the Saugus entrance to Breakheart, turn left, run up to the headquarters and look for the water stop car. If you’re running long go into Breakheart on the right if you want to follow the planned route, go to the left if you want to be different and see the hills first and look at everyone else as you go around. Going left, when you hit the swimming hole go to the right to continue all the way around Breakheart Reservation. If you went left, figure it out yourself it was your bright idea. Either way make your way around and back to the water stop. If you’re running short, or if you ran long and did the loop, just run back the way you came. Run back down to the LynnFells Parkway and go left, continue all the way back to a left at Green Street (second set of lights), merge on to Main Street and get back to Brueggers. The Water Stops : I’ll do the water stop. It’ll be very cold so it might be a self serve deal. By the way, if you didn’t believe me last week, its a thing: Cold Urticaria.